It's a 7" long x 2-1/2" dia PVC tube with a resonant head at one end attached to a 17" long x 3/16" dia extension spring. Kids shake it, scrape it, wiggle it, use their palm to muffle it and they generate creaks, deep warbles, rumbles, weird heterodyne-ish gong effects, wa-wa's, rude noises, and, yes, realistic thunder. A perfect musical companion to a cuica and rain stick - and good, clean fun around the house. These musical neckties are made of corrugated sheet metal and can be played as a musical instrument when strumming metal-capped fingers along it. Perhaps one of the most basic and easy instruments to play, the kazoo is played simply by humming one's favorite tune into the mouthpiece. A sheet of tissue inside the instrument buzzes against its sounding holes to create a distinctive, twangy buzz. This instrument from Trophy is made of sturdy metal and is ready to play instantly. — Three of 48 retailers said during a January 2010 survey that kazoos are their top-selling musical item. Sized for small people, the 30” acoustic guitar from Trophy Music has six steel strings that are tunable with durable metal pegs. It stores well in the heavy cardboard box it comes in, and is also offered in a 34” size. 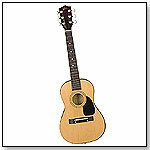 — “Guitars are big sellers,” Paul Faustine of Red Dragon Toys in Brunswick, Maine, said in summer 2008. — Retailers surveyed sold an average of six guitars per month. — Nine percent of 68 retailers named guitars as their best-selling musical toy for children. These Mini Maracas allow kids to participate in just about any style of music. They're loud enough to be heard, but small enough to take along on trips and vacations. Made of specially formulated plastic, they produce a stage-quality authentic sound and come in a variety of colors. — Maracas by Trophy were cited as one of the best-selling musical toys in the store of Gwen Bowden, manager at Doodlehopper 4 Kids in Springfield, Va.
— Four of 45 retailers TDmonthly spoke with said Trophy maracas and shakers are hot-selling musical toys. — Retailers said they sell from three to 30 maracas or shakers a month from Trophy. CircusTime Music Boxes are all wood construction with mechanical components that are key wound to provide beautiful and lyrical songs. The figures spin and dance in unique patterns for a mesmerizing effect. Each individual “dancer” is beautifully painted with bright, vivid colors. A Spinning Music Box and Castle Music Box are also available. The Melody Harp makes it easy for kids and adults to sound like they've taken music lessons for years. Users simply slide a song sheet under the strings, fold down the "tab" to hold the music in place and follow the "dots" with their pick. he Melody Harp is designed with extra strong string posts. They will not bend under string pressure, making it easier to tune and stay in tune. Music is printed on durable and easy-to-keep-clean glossy catalog cover stock. The words to each song are printed right on each music sheet. Includes 12 song sheets. — Marc Holcomb, owner of Toys & Co. in Greensboro, N.C., told TDmonthly in a January 2012 survey that they sell 4-5 units of the Melody Harp each month. Have fun with our new "Country Music Jamboree." Our same high quality musical washboard also comes with an outstanding 10 hole Harmonica and Jaw Harp. Also included are three metal thimbles for a brilliant sound. Perfect for the "Zydeco" sound. Our Children's Grand Piano measures 19" tall, with a 9" tall sturdy bench for your young virtuoso. 27 notes are chromatically tuned using musical bars instead of strings. Circus Time™ is a fun and whimsical line of musical toys specially designed to hold children's interest as they are learning about the wonderful world of music. 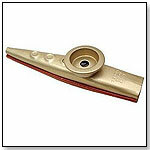 We can imprint your store name, event, logo, etc., on a kazoo. Ask your rep, or call our sales department for details. Frame drums are tambourines without jingles. They produce a very resonant tone when struck with the hand or against the leg. Colorful play mat with instrument sounds and songs. Outstanding value with great tone and is extremely durable. Complete with carrying bag and finger chart. Available in Dark Brown or Ivory. · Setting the mood: What music should you play in your store?